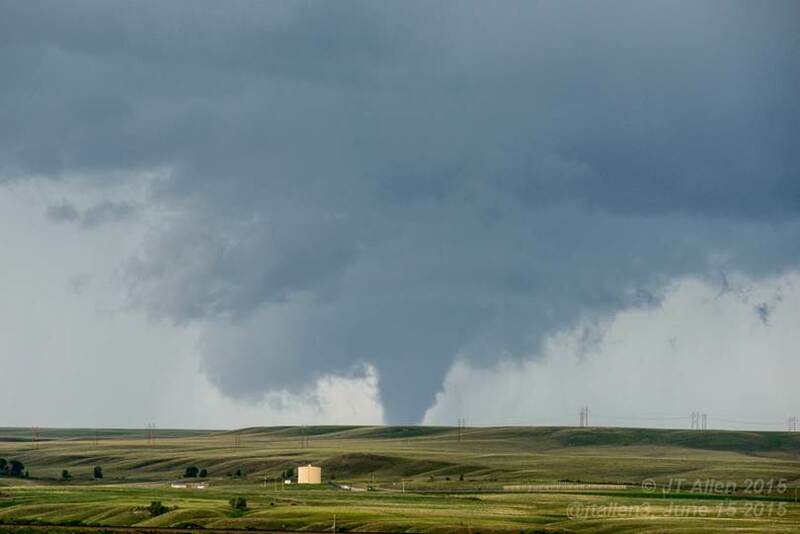 A tornado near Elk Mountain, west of Laramie Wyoming on the 15th of June, 2015. The tornado passed over mostly rural areas of the county, lasting over 20 minutes. John Allen/IRI. Most death and destruction inflicted by tornadoes in North America occurs during outbreaks—large-scale weather events that can last one to three days and span huge regions. The largest outbreak ever recorded happened in 2011. It spawned 363 tornadoes across the United States and Canada, killing more than 350 people and causing $11 billion in damage. The 2016 Severe Convection and Climate Workshop (#SevCon16) starts March 9. Visit the Columbia Initiative on Extreme Weather and Climate for more details. Now, a new study shows that the average number of tornadoes in these outbreaks has risen since 1954, and that the chance of extreme outbreaks —tornado factories like the one in 2011—has also increased. The results are expected to help insurance and reinsurance companies better understand the risks posed by outbreaks, which can also generate damaging hail and straight-line winds. Over the last 10 years, the industry has covered an average of $12.5 billion in insured losses each year, according to Willis Re, a global reinsurance advisor that helped sponsor the research. The article appears this week in the journal Nature Communications. Every year, North America sees dozens of tornado outbreaks. Some are small and may give rise to only a few twisters; others, such as the so-called “super outbreaks” of 1974 and 2011, can generate hundreds. In the simplest terms, the intensity of each tornado is ranked on a zero-to-five scale, with other descriptive terms thrown in. The lower gradations cause only light damage, while the top ones, like a twister that tore through Joplin, Missouri, in 2011 can tear the bark off trees, rip houses from their foundations, and turn cars into missiles. 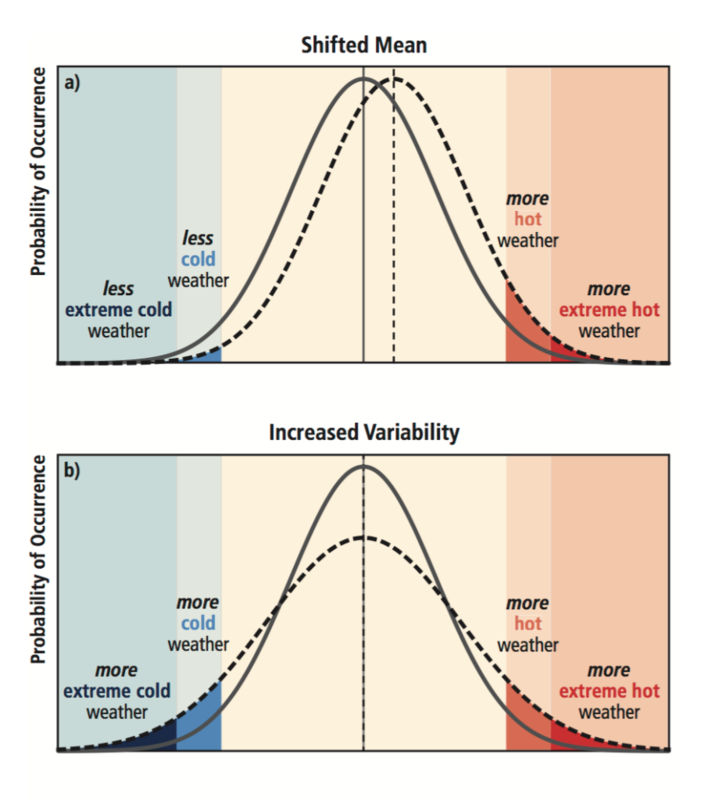 The effect that changing the mean and variance of a distribution has extremes, using temperatures as an example. Source: IPPC. As far as the tornado observational record is concerned, the devil’s in the details. 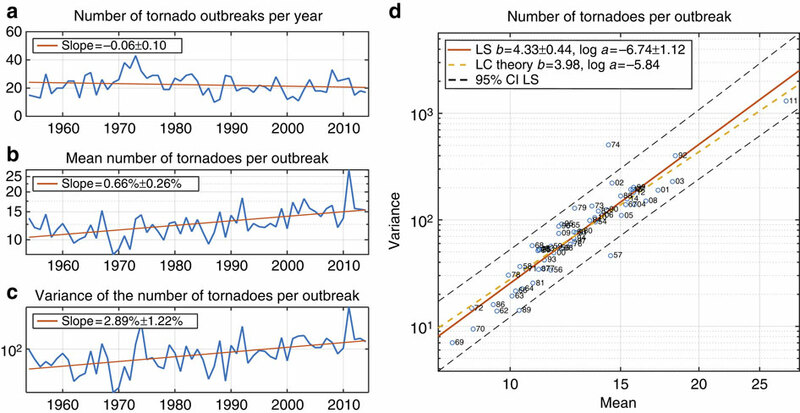 For this study, the authors calculated the mean number of tornadoes per outbreak for each year as well as the variance, or scatter, around this mean. They found that while the total number of tornadoes rated F/EF1 and higher each year hasn’t increased, the average number per outbreak has, rising from about 10 to about 15 since the 1950s. “The analysis showed that as the mean number of tornadoes per outbreak rose, the variance around that mean rose four times faster. While the mean rose by a factor of 1.5 over the last 60 years, the variance rose by a factor of more than 5, or 1.5 x 1.5 x 1.5 x 1.5. This kind of relationship between variance and mean has a name in statistics: Taylor’s power law of scaling. The exponent in Taylor’s law number—in this case, the exponent was 4– can be a measure of clustering, Cohen says. If there’s no clustering—if tornadoes occur just randomly–then Taylor’s law has an exponent of 1. If there’s clustering, then it’s greater than 1. “In most ecological applications, the Taylor exponent seldom exceeds 2. To have an exponent of 4 is truly exceptional. It means that when it rains, it really, really, really pours,” says Cohen. (a) Number of tornado outbreaks per year. The rate of decline is not statistically significantly significant. (b and c) Annual mean number of tornadoes per outbreak and annual variance of the number of tornadoes per outbreak. Vertical axes are on a logarithmic scale, so the rate of increase in the annual mean is expressed as a percentage per year. (d) The annual mean number of tornadoes per outbreak versus the annual variance of the number of tornadoes per outbreak. Both axes are on a logarithmic scale. The solid line represents Taylor’s power law of fluctuation scaling. The two-digit number next to the plotted symbol gives the calendar year in the second half of the twentieth century or first half of the twenty-first century. Extreme outbreaks have become more frequent because of two factors, Tippett said. First, the average number of tornadoes per outbreak has gone up; second, the rapidly increasing variance, or variability, means that numbers well above the average are more common. Tippett was concerned that the findings could be artifacts of tornado observational data, which are based on eyewitness accounts and known to have problems with consistency and accuracy. To get around this, he re-ran his calculations after substituting the historical tornado data with environmental proxies for tornado occurrence and number of tornadoes per occurrence. These provide an independent—albeit imperfect—measure of tornado activity. The results were very nearly identical. Insurance and reinsurance companies and the catastrophe-modeling community can use this information. Findings are a real concern for insurance companies writing business in multiple states. If single outbreaks are generating more tornadoes, total losses to insurance portfolios and the economy could be significant. Insurance companies have contracts with reinsurance companies, and these contracts look similar to the ones people have for home and car insurance, though for much higher amounts. The new results will help companies ensure that contracts are written at an appropriate level and that the risks posed by outbreaks are better characterized, said Brooks. “One big question raised by this work, and one we’re working on now, is what in the climate system has been behind this increase in outbreak severity,” said Tippett. This research was also supported by grants from Columbia’s Research Initiatives for Science and Engineering, the Office of Naval Research, NOAA’s Climate Program Office and the U.S. National Science Foundation.